Communicating a business outcome for complex products and solutions is extremely difficult to demonstrate “live” in the real-world with physical products or less tangible solutions (such as cloud computing, software data flows, electric grid re-routing, or molecular reactions). Demonstrating these complex solutions within a “virtual” immersive environment – such as a hospital, laboratory, data center, manufacturing plant, or oil refinery – that is contextually relevant to the user can be a highly effective way to help customers relate to what the product or solution is, how it works and why it will benefit them. Among all the sales representatives competing for attention with emails pitches, cold calls, trade show booths, and just plain knocking on doors, it’s often hard to stand out and make a lasting impression on potential customers. VR, though, injects a well-recognized pizzazz into your presentations. Audiences never get tired of the physical sensations they get from stepping into a 3D virtual world and experiencing it as breathtakingly real while knowing it’s entirely simulated. Around every VR display there typically grows a buzz and an eager crowd of prospects waiting their turn to experience the excitement of a virtual world. That pizzazz along with the sensory isolation that accompanies immersion into a VR environment means your customer is giving you their undivided attention. The simulated world occupies their entire field of vision with no possible distractions—a dream come true for marketing and sales teams. The unique visceral experience of VR also delivers a lasting impression and helps build strong emotional brand connections. • The big view: VR delivers an overarching view of the design or product in 3D, with the ability to easily shift angles of view or get the eagle’s eye perspective of overall design and physical layout. • Up close: Zoom in and visually inspect with millimeter precision such technical details as engineering components, minute computer chips, or deep inside inaccessible HVAC piping. VR enables participants to view design specifications they never could in real life and see them in context. • The human perspective: Often missing from blueprints, PowerPoints, or architectural models, VR allows clients to view a project at a realistic life-size scale. Participants can walk around the product, examining its layout and size from the perspective of those who would actually use it. 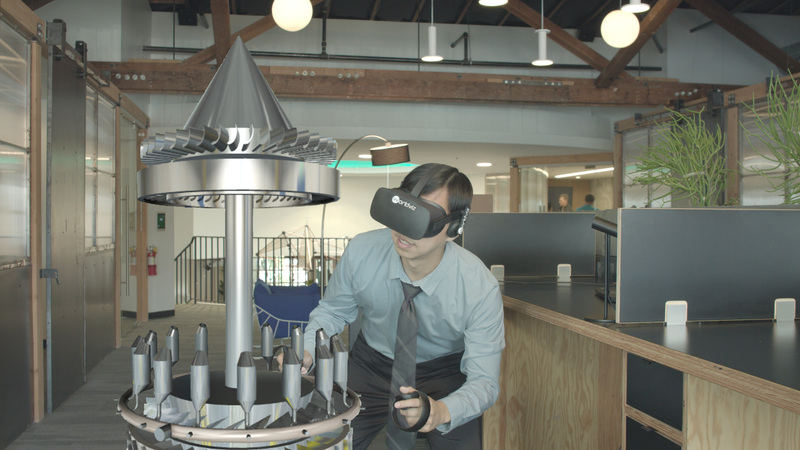 Unlike actual physical products, VR environments can be customized to your prospect’s requirements or modified in seconds by interchanging pre-existing components or flipping through design alternatives. Sales reps can easily create presentations like a PowerPoint slide deck—no programming required. Sales teams can showcase products and designs in immersive 3D to remote clients or geographically dispersed work teams with zero need for travel. Using such VR programs as WorldViz’s Vizible, you can invite participants to join a virtual reality environment online for a shared virtual experience. Participants move around the simulated space to inspect the product, interact with and annotate VR objects, measure distances, or even use a virtual laser pointer. Travel costs will be sharply reduced and the sales cycle accelerated without compromising face-to-face time. Virtual reality offers sales teams a powerful, innovative tool to showcase products in ways never before seen. Stepping into a simulated 3D world will set fire to your client’s imagination while letting them actively explore your product in its full life-size functionality—from its overall visual display and physical siting down to its most minute technical specifications. An immersive virtual environment offers a captivating method to easily engage and educate prospects. At the same time, VR resolves critical issues for sales organizations, most notably how to cut the escalating cost of travel and how to stand out from the competition. Our VR creation and collaboration tool Vizible is already being used by salespeople from leading organizations around the world. Sign up to try it here. Want to read more about how Siemens and Premursa use VR for sales? Read this whitepaper.